University of Leicester archaeologists have made a ‘once-in-a-career’ discovery of the decorated bronze remains of an Iron Age chariot. 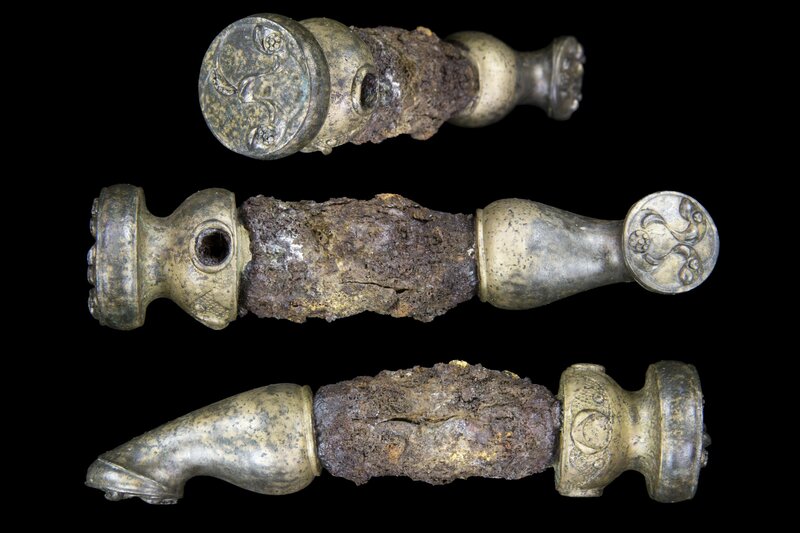 A team from ULAS and the University’s School of Archaeology and Ancient History has unearthed a hoard of rare bronze fittings from a 2nd or 3rd century BC chariot which appears to have been buried as a religious offering. 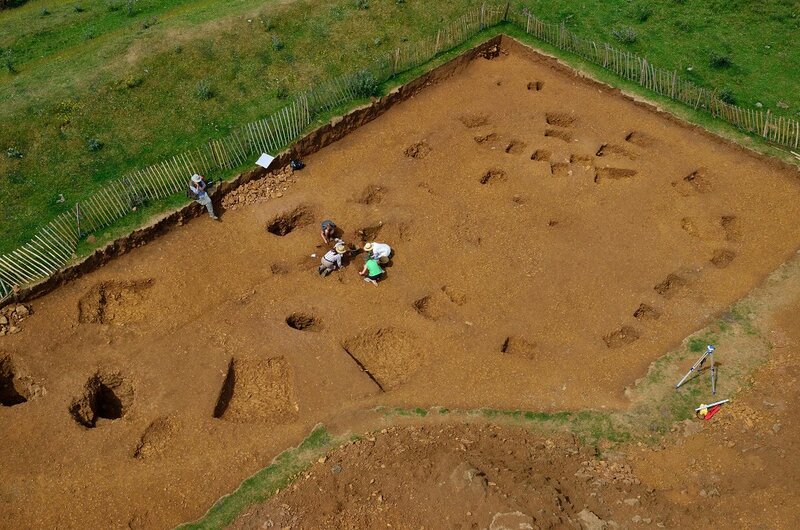 The archaeologists found the remains during their ongoing excavation of the Burrough Hill Iron Age hillfort, near Melton Mowbray, Leicestershire. The School has led a 5-year project there since 2010, giving archaeology students and volunteers valuable experience of archaeological excavations. Burrough Hill is owned by the education charity, the Ernest Cook Trust, which has also funded site tours and school visits to the excavation. While digging a large, deep pit near the remains of a house within the hillfort, a group of four students found a piece of bronze in the ground – before uncovering a concentration of further parts very nearby. 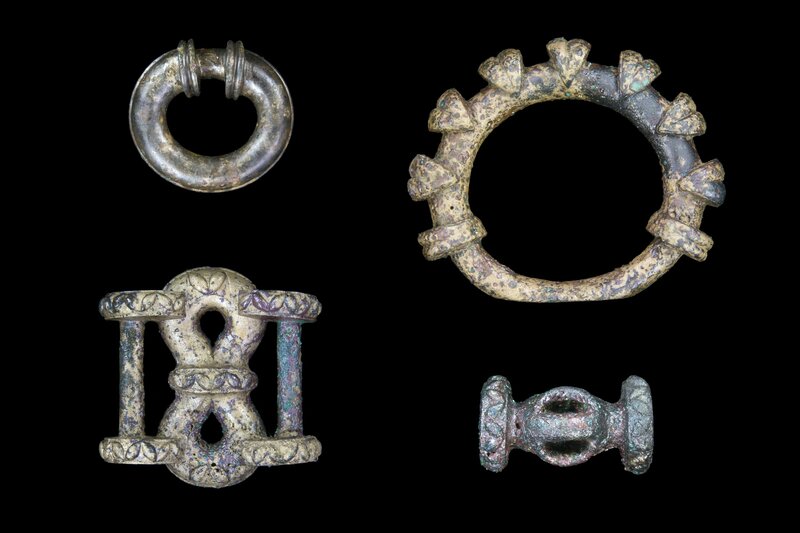 Taken together, the pieces are easily recognisable as a matching set of bronze fittings from a mid to late Iron Age chariot. As a group of two or more base metal prehistoric artefacts this assemblage is covered under the Treasure Act. After careful cleaning, decorative patterns are clearly visible in the metalwork – including a triskele motif showing three waving lines, similar to the flag of the Isle of Man. Linch Pin from an Iron Age chariot. Image copyright University of Leicester. The pieces appear to have been gathered in a box, before being planted in the ground upon a layer of cereal chaff and burnt as part of a religious ritual. The chaff might have doubled as a ‘cushion’ for the box and also the fuel for the fire. After the burning, the entire deposit was covered by a layer of burnt cinder and slag – where it lay undisturbed for more than 2200 years until the team uncovered it. The archaeologists believe the chariot would have belonged to a high-status individual, such as a ‘noble’ or ‘warrior’. The team believe the burial may have taken place to mark a new season, or the final closure or dismantling of a house at the fort. The parts have been taken to the University of Leicester’s School of Archaeology and Ancient History for further analysis – and the archaeologists hope they will be put on public display in due course. Before then, there will be a temporary display of the objects at the Melton Carnegie Museum, Melton Mowbray, Leicestershire, from Saturday October 18th until Saturday December 13th. The Burrough Hill excavation was undertaken to a detailed research design with the consent of the Department for Culture Media and Sport (advised by English Heritage), and the permission of the Ernest Cook Trust (landowners), and Leicestershire County Council (site management).